Chickpea (Cicer arietinum L.) is the second largest food legume in the world occupying 15 percent of the total pulse area globally and cultivated in almost 52 countries (FAOSTAT, 2012). It currently occupies in 11.98 million hectares with a production of 10.92 million tons (FAOSTAT 2012). Chickpea plays an important role in human diet and animal feed besides it helps in maintenance of soil fertility, particularly in dry lands. The ability of chickpea in fixing nitrogen in soils provides benefits not only to legumes themselves – but also to subsequent crop makes it an important choice in the farming systems. 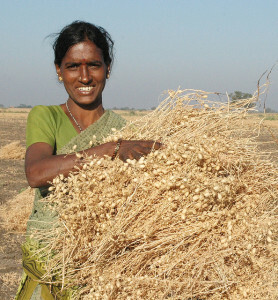 The CGIAR Research Program (CRP) on Grain Legumes with ICRISAT as lead center together with partners developed advance research program on high-priority challenges such as development of heat-tolerant chickpea, high nitrogen-fixing chickpea, Insect-smart chickpea and extra-early chickpea to maintain chick pea production in view of anticipated climate change in chickpea growing regions.